Ulano Sta-Sharp S3S Film is a lacquer-based, water-resistant knife-cut stencil film that has been reformulated to be free of VOCs (Volatile Organic Compounds). 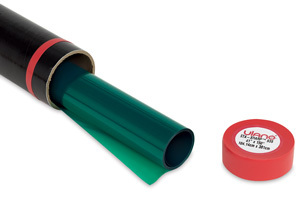 This fast-cutting, green-colored film adheres to the screen with an adhering solvent, and can be used with all inks except for lacquer, vinyl, and plastisol inks. It is attached to a .003" polyester backing for greater stability. Except for requiring a longer drying time after adhering the film (approximately 15 minutes), reformulated Sta-Sharp S3S Film cuts and peels the same way as its predecessor and is compatible with the same inks. This environmentally friendly version does not require special ventilation during use. Note — This product cannot be used with Ulano's traditional Sta-Sharp Adhering Liquid. It must be used with Ethyl Acetate or Ulano's reformulated Sta-Sharp Adhering Liquid.